Food and Wine. Wine and Food. No wonder it can be challenging when we can’t even decide which one comes first. My wife and I have done literally dozens of wine pairing sessions in different formats around the world. Large and small, at wineries and restaurants (both brick and mortar and pop-ups.) Many were fantastic experiences, but as with any art, questions remain. The main thing I reminded myself was to enjoy the experience–after all I got to be with my beautiful wife who also enjoys food and wine and we had chosen to vacation and ultimately work in this manner for many years–nothing wrong with that. From a classical food pairing point of view, wine tended to follow food, then chefs and winemakers would have more of a give and take to create what we know as regional food pairings from the old world. These days classical food pairing is less common, as is classical dining in general–otherwise we wouldn’t be trying to find wine that goes with the food of the moment–nachos, BBQ etc. It is also a great time because there is such a broad set of options for pairing–so much wine, so little time. The high points of wine being paired to food, not the other way around, is significant both in traditional and more rigid pairing. Foods were most commonly developed first, then wines were developed to work with them. While that can serve as a good basis for the popularity of ‘local” food and beverages, it can get a little rigid and endless. On the other hand, we can also just let the wine and terroir speak. The goal of this article is to create a marriage of food and wine rather than to compliment or contrast grapes that live in the colder climates areas of the U.S and the Midwest. For this first article, we will look at some pairing ideas for La Crescent wines. Briefly, we will discuss pairing in terms of tastes, and as importantly body styles. This perspective comes in part from the Advanced Food and Wine Pairing training available though the International Wine Guild. If you want to pair wines regardless of foods this is a GREAT system–I strongly suggest taking the course. It completely changed my approach and made me better at wine pairing. The training also can make you a confident and consistent wine buyer. Above all, the system works. While some of the Guild’s techniques are applied here, I am only looking to make those techniques useful for cold climate wines and not all information mentioned here is information from the Guild. It’s amazing how cold hardy wines have changed and evolved in recent years. While this can make pairing a bit like aiming at a moving target, a few things remain constant. For example, a good sommelier can generally tell a grape variety regardless of region, and maybe even the vineyard in certain cases. This suggests there are characteristic flavors for Cab Sauv, for instance, that are base flavors regardless of terroir and region. If that is true for vinifera, it is likely true for other varietals as well. 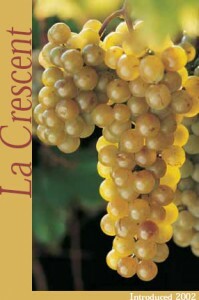 For our purposes, we will find some things to rely on with La Crescent wines. So where does that take us in terms of pairing food with La Crescent? Utilizing previous flavor profile data, we found an affinity between La Crescent and lemon flavors which retain and accentuate fruitiness in this case. Other flavors include white pepper (fruitier than other grindable peppercorns), cumin (again slightly lemony) and ginger, which seems to apply with every cold climate varietal. For example, a simple roast chicken produces the same amount of leftovers and is not laden with salt. Pease take the time roast it rather than buying a pre cooked chicken. It only takes an hour at 350 degrees. Then you can chose any tandem of those spices and herbs and it will work great with La Crescent. And a roast chicken hits the medium body style pretty squarely, so maybe a roast chicken seasoned with lemon thyme and cumin and ginger? Also boil a few potatoes, a couple cloves of garlic while the chicken roasts, then mash with a bit of sour cream and butter and white pepper. Add your favorite veggie and you have a meal that will be done in an hour, takes only three containers and matches well with La Crescent. Done, done, and done. For a dip that works well for entertaining I suggest the following recipe that will again hit the La Crescent flavor combinations and works with the body style. It’s a white bean dip that is really low fat and quick, if you use canned white beans and tasty for crackers, breads etc. Almost a white bean hummus–uses two of the flavors that bring out the fruitiness in La Crescent. Soaked in water over night or use two cans of great northern or cannellini beans with their juice. 1. Soak 1 cup dry beans in water 8 hours or over night. Drain and put in pot with garlic, cover with stock. 3. Place all contecntsof pot and all other ingredients in food processor(or blemder or use stick blender) and blend until smooth. Also works well as a low fat alternative to hummus.